Grind garlic, salt, black pepper, cumin, oregano, and coriander into a paste using a mortar and pestle or food processor. Transfer half of the garlic and spice paste to a bowl; add lime juice, orange juice, extra virgin coconut oil, and vinegar. Beat the mixture with a whisk until smooth. Cut several inch-long, deep slits into the fatty side of the pork roast. Rub the reserved garlic paste into the slits. Put rubbed roast into a gallon-size resealable plastic bag. Pour the liquid mixture over the roast, squeeze as much air from the bag as possible and seal; refrigerate, turning occasionally, 8 hours to overnight. 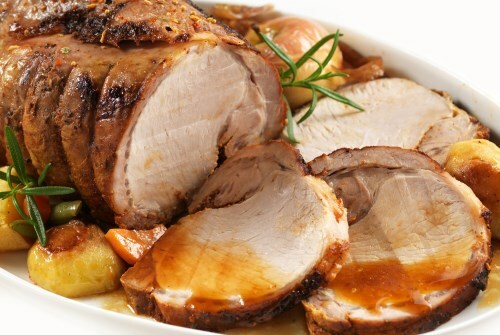 Remove pork roast from refrigerator, put into a roasting pan, and let warm at room temperature for 30 minutes. Roast pork in preheated oven for 30 minutes, reduce heat to 375 degrees F (190 degrees C), and continue cooking until pork is no longer pink in the center, about 2 hours more. An instant-read thermometer inserted into the center should read at least 170 degrees F (75 degrees C).